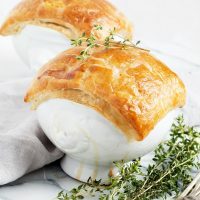 A hearty chicken pot pie made easy with store-bought puff pastry for the topping. Great use for leftover turkey, too! Do ahead: Thaw puff pastry and the roll out on a lightly floured surface into a 1/4-inch thick square or rectangular larger than the dimensions of your baking dish (or disheby about 3 inches on each side. Transfer to a baking sheet, cover tightly with plastic wrap and refrigerate for at least 1 hour. Remove chilled dough from refrigerator, and place on a cutting board. Place your intended baking dish directly onto the dough, with the opening side down. With a sharp knife, cut around the dish so that you have an even 3 inches around the dish on all edges. Return the dough to the baking sheet, wrap tightly with plastic, and chill for an additional hour. Prepare vegetables and chicken and have ready. In a large heavy pot, melt 5 tablespoons butter over medium-high heat. Add the onion, potatoes, and carrots. Cook, stirring regularly, until the potatoes and carrots are tender, about 10 minutes. Add the mushrooms, cooking until mushrooms are heated through. Add cognac (if usinand cook down for about 30 seconds. Add flour, and cook, stirring, for 1 minute. Pour in chicken stock and milk. Stir well. Bring to a simmer and cook until thick and bubbly, stirring constantly, 2 to 3 minutes. Stir in chicken, peas, parsley, and thyme. Taste and season well with additional salt and pepper, if necessary. Transfer filling to your baking dishes, filling not quite to the top, so there will be a bit of space between the filling and the topping. Let stand to allow to cool 10 -15 minutes before topping. Meanwhile, place oven rack in lower third of the oven and preheat oven to 425° F.
Prepare your egg wash by combining 1 egg and 1 tsp. water. Remove dough from refrigerator and brush surface evenly with egg wash. Measure how bit a piece your will need to cover the top of your baking dishes and cut pieces of puff pastry to that size. Invert dough (with egg brushed side down) and place directly over the casserole, pressing lightly to seal overhanging crust to the side of the dish. Brush top surface of dough with egg wash. Transfer dishes to a baking sheet lined with foil or parchment (to catch any boil-over!). Bake for 10 - 15 minutes (or until crust is nice and golden), then cover loosely with aluminum foil to prevent crust from burning, and continue baking for about 25 minutes more, or until filling is bubbling and crust is golden. Serve hot.